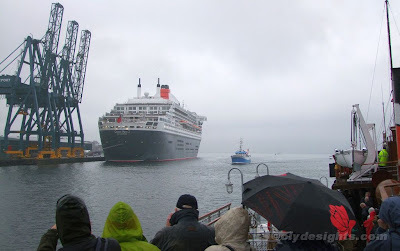 WAVERLEY offered two special sailings to mark QUEEN MARY 2's visit to Greenock. 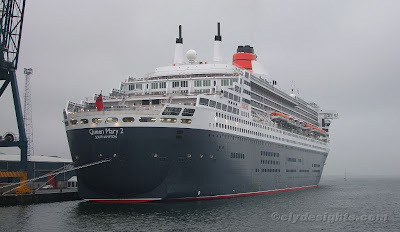 The first, a daylight sailing, offered passengers from Glasgow the opportunity of a close-up look of the liner as she lay at Ocean terminal. Sadly, the weather was not quite as nice as that which had graced her illustrious predecessor's final visit to the Clyde last year. QUEEN MARY 2 is a ship of many superlatives. When built, she was the largest passenger ship ever constructed, both in length at 345 metres, and in tonnage, at 148,528 gross tons. She was also the widest and highest, as well as being the largest in terms of displacement at 76,000 tonnes. She was also the first major liner, as opposed to a cruise ship, that had been built since QUEEN ELIZABETH 2 was delivered in 1969. 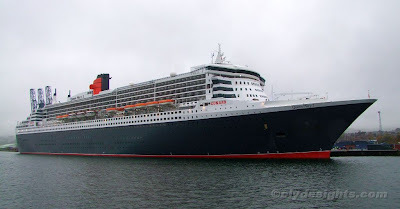 QUEEN MARY 2 was built in France at the Chantiers de l'Atlantique shipyard at St Nazaire at a cost of £460 million, and was delivered to Cunard in December 2003. She can carry up to 2,620 passengers and she carries a crew of 1,253. Her main propulsion comes from a combined diesel-electric and gas turbine power plant, the latter being housed in the base of the funnel. Four electric propulsion pods - two fixed and two azimuthing - give the liner a speed of almost 30 knots, although she normally steams a little slower at around 26 knots.